I started incorporating ashwaganda (an adaptogenic herb) into my diet a few months ago. Despite all of the coping mechanisms and practices I have, I had a really, really, reeeeeeeeaaallly hard year and my nervous system was frazzled. I have essentially been in a constant state of crisis/loss/grief/stress for two and a half years straight — and stress physiology is NO JOKE. I had signs and symptoms of elevated cortisol and in general felt “on edge”, even when doing things like yoga or meditating. 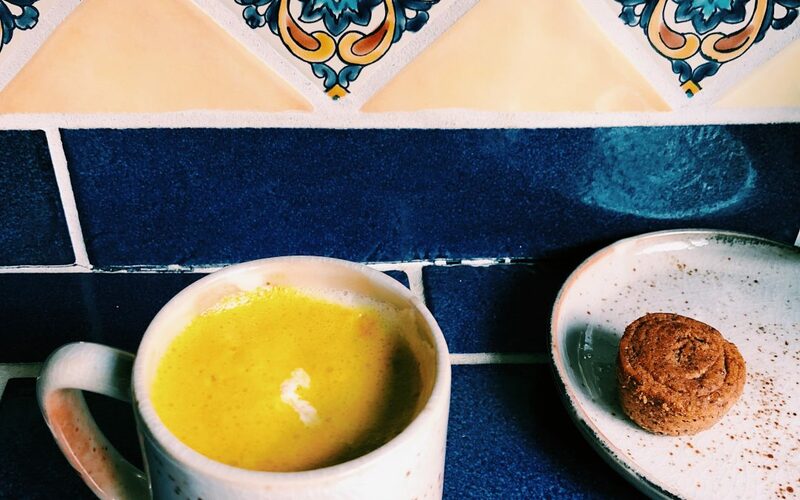 My incredible Naturopath recommended ashwaganda and I have noticed a big difference since incorporating it into my morning drink, an ashwaganda-turmeric latte, otherwise known as Golden Milk. There are about a million healing benefits to the herbs I use in my Golden Milk mix, but personally, I am focused on using ashwaganda for the stress-hormone-balancing effects and turmeric for it’s anti-inflammatory properties. I buy my herbs in bulk from Mountain Rose Herbs and also add Vital Proteins collagen powder to my morning drink (collagen powder adds 20 gm of protein and dissolves easily in hot or cold liquid – I take 2 scoops one way or another every single day).